Hotel Souvenir , a three-star superior hotel on Cervia's seafront, offers comfortable and elegant accommodation. Among the services available: free parking, WI-FI, pets allowed and high quality restaurant. The hotel is managed by the owners. 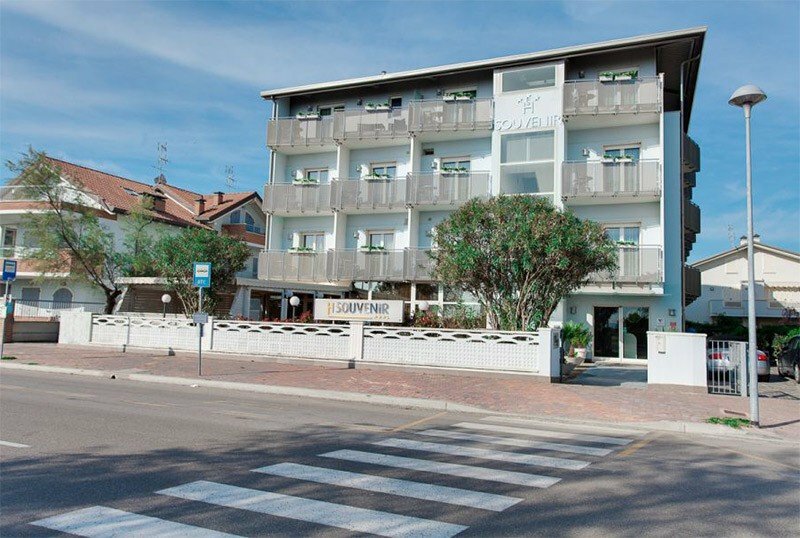 The hotel is located on the seafront Grazia Deledda in Cervia, facing the beach: just across the road to reach the sea. It is a few steps from the pine grove of Cervia and the historic city center. The rooms are all equipped with air conditioning, WI-FI, minibar, LCD TV with digital terrestrial, digital safe, telephone and private bathroom with shower, vanity mirror and hairdryer. COMFORT : equipped with all the amenities already listed and a balcony. SUPERIOR : with side sea view and balcony. EXECUTIVE : seafront room with balcony. PANORAMIC : bigger than the previous ones, seafront location with balcony and 32 "LCD TV. Bathrobe and slippers are available in the bathroom. SINGLE : with balcony, some with sea view, the bed can be single or French. Lift, reading room, beach towels, newspapers, paid laundry service, theme nights, room service. PARKING: uncovered, available to all customers. AIR CONDITIONING : available in both common areas and rooms. SERVICES FOR DISABLED : entrance on the ground floor, elevator to standard, room located on the ground floor with wheelchair maneuvering space and aids, shower with wheelchair access, chair for shower. PETS : small pets allowed, bed and bowl service. Supplement for room sanitation. BREAKFAST : sweet and savory dishes, fresh fruit and hot and cold drinks. LUNCH AND DINNER : buffet lunch with choice of 4 first and 4 second courses, raw and cooked vegetables and desserts. At dinner the menu is à la carte, with fish and meat dishes. Pasta and desserts are homemade. In the hotel: outdoor playground area, baby sitter service and pediatrician (both for a fee). In the room : bottle warmer and cot for a fee. On the beach : games for children and kids club every day, except Sunday. The hotel is located in front of the Bagno n. 169. Among the services offered: sports fields with beach tennis, balls and other equipment available, gymnastics and muscular awakening by the sea, bar, restaurant, happy hour, theme parties and live music. Price list prices are per person per day, for a minimum of 3 days respectively in full board (water with meals included + beach) and half board. TOURIST TAX: not included in the price list. € 1.00 (April-May-September), € 1.50 (June-July-August) per person per day for a maximum of 7 consecutive nights, excluding children up to 14 years. - Small pets: € 7.00 per day excluding meals. - All cancellations and / or changes to the booking must be made by email and / or fax: - Cancellation up to 30 days prior to arrival: refund of the deposit; Cancellation up to 14 days prior to arrival: refund of 50% of the deposit paid. - Changes after booking may not guarantee the same type of room booked. Our Easter packages designed for you! Family room. 2 nights (Fri + Sat) € 180.00- (Sat + Sun) € 200.00- 3 nights (Fri + Sat + Sun) € 260.00.